How to make classic crispy waffles that turn out perfectly crisp on the outside and light and fluffy on the inside every time! When it comes to great waffles, they must be crispy on the outside and light and fluffy on the inside. That’s what makes a waffle a waffle, right? Otherwise, we may as well just make some great pancakes. We’re a waffle loving family and we all get so excited when the waffle maker gets brought out. 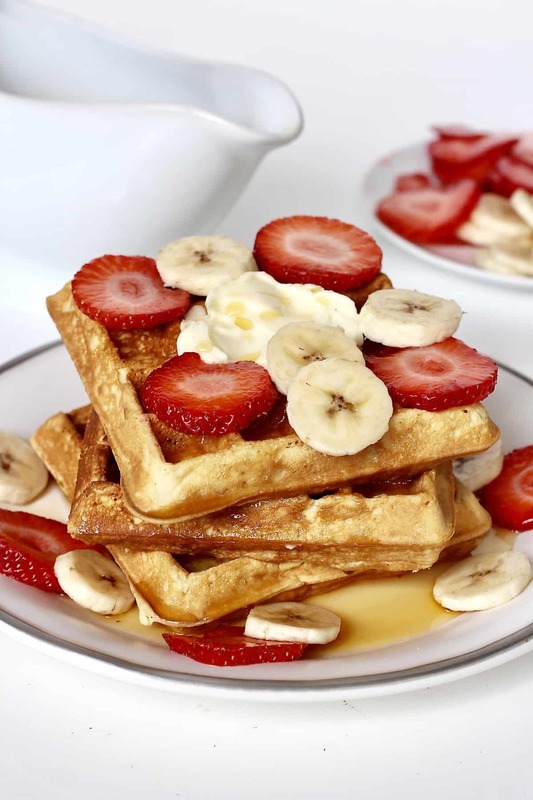 Whether it’s a lazy Sunday morning or a busy weeknight (Waffle Wednesday is our fave! 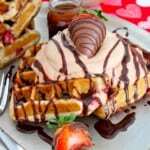 ), this easy waffle recipe makes everyone happy! And making waffles from scratch is so much better than the store-bought frozen waffles you pop in the toaster. Sooo much better. I get such a kick (and a lot of pride!) out of how particular our boys are about their waffles since we make these perfect waffles here at home all the time. 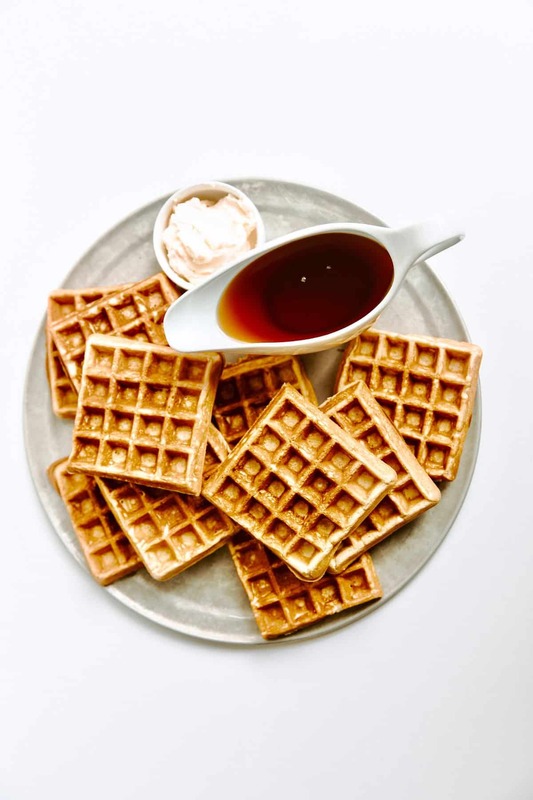 We’ll be out to breakfast and my 7 year old will place his order saying “I’d like an order of the CRISPY waffles, please!” following immediately with “You make ’em crispy, right? 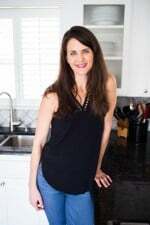 !” I get the biggest grin on my face and feel so happy knowing that he knows what a great waffle should taste like. No floppy waffles for us. Haha! 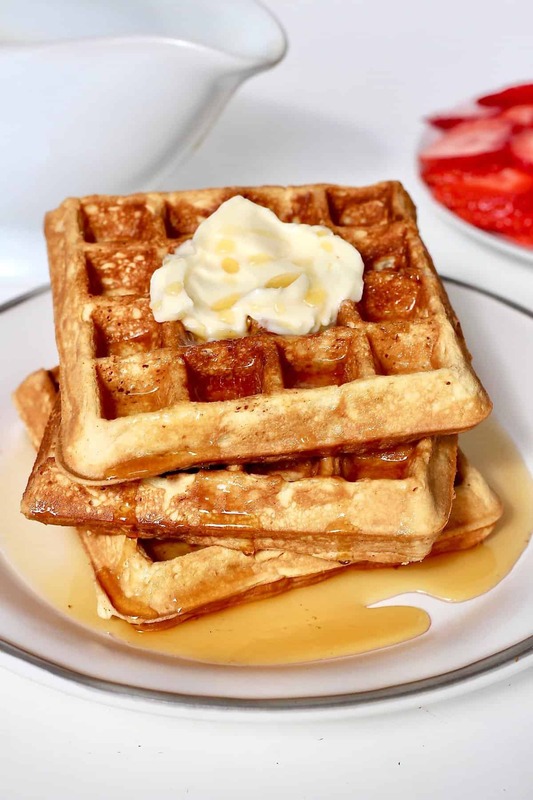 Sugar: just 2 tablespoons of sugar in the batter gives the waffles that boost they need to create an extra crispy and caramelized exterior as they cook. The key is stirring the sugar into the batter at the very end so it doesn’t get lost in the batter as it would if you add it in the beginning with the dry ingredients. Fat: a good amount of butter and whole milk in the batter does two things for the waffles. 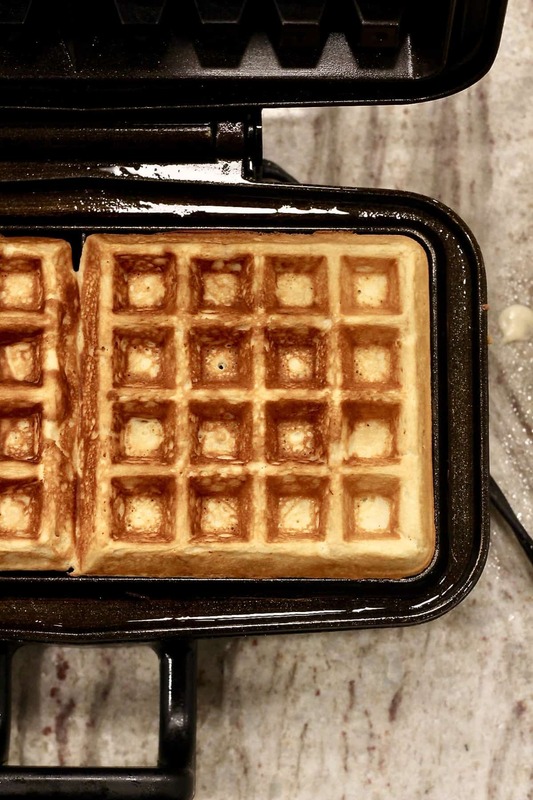 It helps keep them from sticking to the waffle maker and it adds to the crispness because when the fat hits the high heat, it has a fry-like affect creating that crisp exterior and protecting the inside so it stays light and fluffy. Don’t use buttermilk though. I’ve found that buttermilk is too thick and creates a very dense textured waffle. 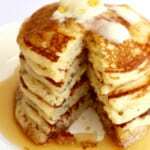 Well Beaten Eggs: beating the eggs until light and frothy before folding them into the batter adds air to the batter without risking over beating the batter. The air pockets in the batter help contribute to the fluffiness of the waffles as they bake. 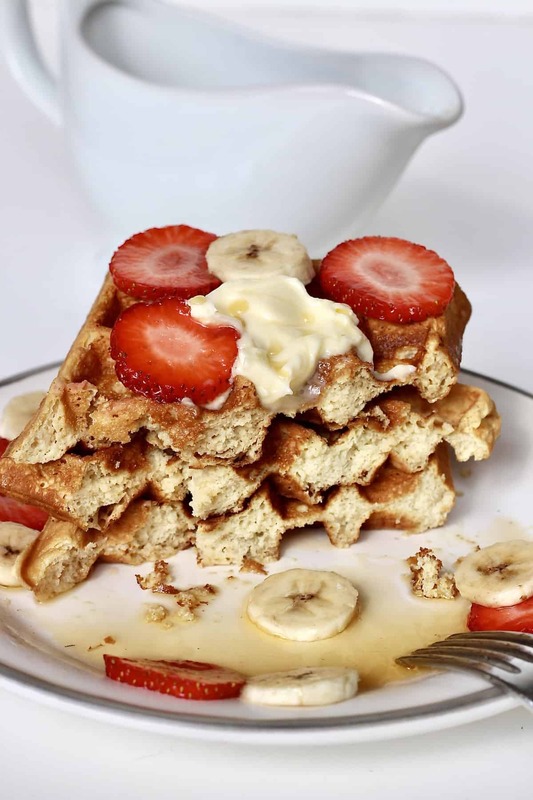 Let the Batter Rest: letting the batter rest in the fridge for about 10 minutes, while the waffle maker preheats, allows the gluten to relax and expand a bit which results in a more tender texture as the waffles cook. And the cooler batter, helps keep the insides from overcooking while the exteriors get nice and crisp. Hot Waffle Iron: preheat your waffle iron for at least 10 minutes. Cooking waffles in a waffle iron is similar to frying, the hotter the heat, the crispier the outcome. And the quicker they cook, the lighter the insides. Keep them Warm: you want to keep the already cooked waffles warm while you make the remaining waffles so everyone’s waffles are warm and still crisp when you sit down to eat them together. 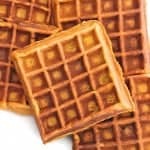 Heat your oven to 200°F and store the cooked waffles in a single layer on a baking rack or directly on the oven racks. The oven actually reinforces the crispiness and prevents sogginess. And there you have it! 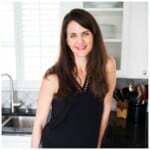 My best tips for making perfectly crisp waffles after years and years of making them for us on a weekly basis. If you’re going to go to the effort of making waffles, make them great! It makes all the difference. 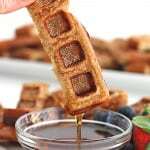 A perfectly crisp waffle holds the butter and syrup so nicely as you cut in. It doesn’t soak up too much of the moisture allowing each bite to still be crisp yet buttery sweet. Drooling yet?! And if you happen to have leftovers, you can store them in the fridge or freezer. When you’re ready to reheat them, I highly recommend you toast them in a toaster just like you would toast. It crisps them right back up. 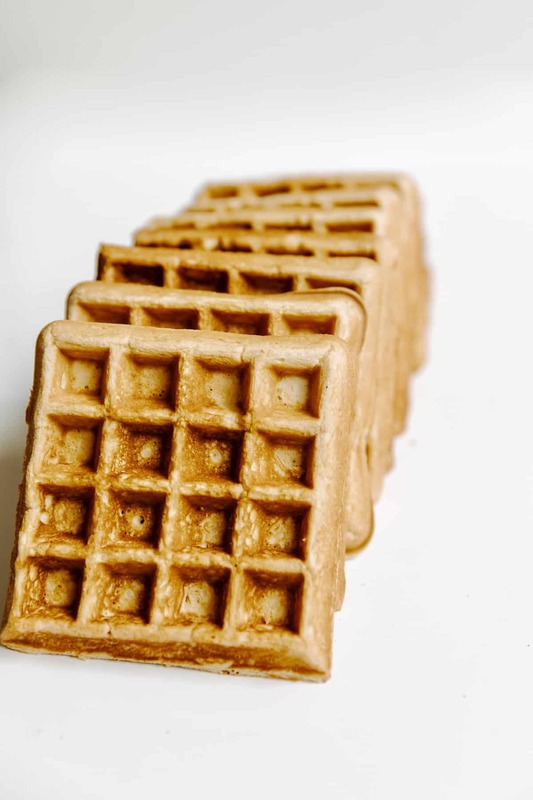 If you’re reheating several leftover waffles at a time, you can lay them in a single layer on a baking rack or directly on the oven racks in a 300°F heated oven for about 5-10 minutes depending on if they were frozen or just refrigerated. We keep it pretty classic when we eat waffles by serving them with creamy butter, good quality maple syrup and some fresh fruit. I’ll occasionally put out some peanut butter and Nutella to mix it up a bit because, seriously, we eat these waffles at least once a week! I hope you and your loved ones enjoy this recipe as much as we do! In a large mixing bowl, whisk together the flour, baking powder, baking soda & salt. Make a well in the center of the dry ingredients and add the milk, whisking until just combined. Whisk in the melted butter and vanilla until well combined. In a separate bowl, beat eggs until light and frothy and then fold the eggs into the batter a few times. 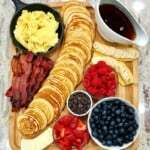 The batter should be streaked with the beaten egg. Sprinkle the batter with 2 tablespoons sugar and gently fold it in until very few streaks of egg are showing. The batter should still be slightly lumpy. Let the batter set in the refrigerator for at least 10 minutes while you preheat the waffle maker to medium-high heat. Generously spray top and bottom of the waffle maker with non-stick cooking spray and cook waffles according to your waffle maker's instructions. For my waffle maker, I fill it about three-quarters of the way full, spreading it to fill in any gaps. Close the lid gently and cook until the waffles are golden brown and crisp, about 5 minutes. I try not to peek for at least 4 minutes. Keep the cooked waffles in a 200°F warm oven while you make the remaining waffles. 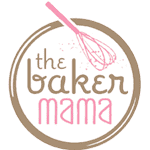 Can you make the batter a day ahead? Thinking of making these for Easter brunch! Hi Julie! Absolutely, just cover the bowl with plastic wrap and store in the refrigerator. Then allow it to come to room temperature for about 30 minutes before cooking the waffles. Enjoy!